This past week saw French Presidential centrist candidate Emmanuel Macron match the predictions of the final polls in the presidential election to win the vote as the next president of the Fifth Republic of France. He inherits a nation bitterly and deeply divided with enormous social and economic challenges and problems and with limited prospects for a much-needed governing majority in the French Parliament with the upcoming June elections. Meanwhile across the English Channel in another important European election, British Prime Minister Theresa May's Conservative Party won its largest victory in decades in the local council and district elections throughout England, Scotland, and Wales. This astonishing result decimated the major rival Labour Party as well as challengers the UKIP, Liberal Democrats, and even the Scottish Nationalist Party. The UK economic manufacturing output delivered stronger than expected growth which was the highest in three years, helping boost May's case. In India, the International Monetary Fund revealed that the world's largest democracy will soon pass both Great Britain and Germany as first the fifth and then fourth largest economy in the world in 2017 and 2022, respectively. The huge nation has enormous economic challenges to overcome in between now and then, yet it is another indicating sign that the post World War II global order is changing dramatically. Gold is the insurance that will protect your investment and retirement accounts from a worldwide shift that is already well underway. Today's news shows why there are more Gold IRA pros than cons. Emmanuel Macron's ultimate 65 percent of the vote victory over Marine Le Pen with her roughly 35 percent concludes the rollercoaster-like campaign that turned bitter and ended with a widespread massive hacking attack on Macron the very last night of the campaign. In an election that has re-defined France, both the leftist socialist and right-leaning conservative traditional parties of the Fifth Republic were swept aside. Former President Nicolas Sarkozy and former Prime Minister Manuel Valls were humiliatingly defeated in early primaries. Incumbent President Francois Hollande did not even bother to try for reelection. Favorites such as former Prime Minister Francois Fillon were brought down in scandals. The first round of voting saw the far-left leader Jean-Luc Melenchon secure nearly 20 percent of the first-round results, and far-right National Front Candidate Marine Le Pen win 21 percent. Macron has made huge promises to try to reform the listing French economy that boasts 10 percent unemployment, which is double that of both Great Britain and Germany and three times that of Malta. He promised he will cut business taxes, allow greater corporate flexibility to promote competitiveness in French industry, and boost the euro. Yet without holding at least the largest voting block in parliament, Macron will not even be able to have his own prime minister and cabinet running the government. That authority falls to the parliamentary majority in the French system. Macron next moves on to meet with Germany's Premier Angela Merkel and America's President Donald Trump at the Brussels' NATO leaders' meeting and the Group of Seven Sicily summit later in May. While this is interesting diplomacy, if Macron can not win an outright majority in the parliamentary elections next month (where he has not a single representative currently), then France's major problems will only be getting worse and not better. The French presidential election has not yet solved anything, despite the hope that Europe is desperately clinging to with the results. Owning physical gold through an IRA will give you an asset that outperforms traditional asset classes in market crisis periods. Last week saw yet another important election (with a more conclusive result) in France's neighboring country the United Kingdom. Prime Minister Theresa May's Conservative party enjoyed a landslide victory in the country's local elections. This has already been called a foreshadowing of the enormous victory that the upcoming June 8th general elections look set to yield. May is hoping to emerge without rivals in an effort to boost her Brexit talks' bargaining position versus the European Union's so far united front. The Conservative Party took 1,882 out of 4,851 local council seats across England, Wales, and Scotland. This represented an impressive 556 seats net gain. They took control of 11 districts and counties. Meanwhile, the main rival party Labour suffered a devastating loss of 385 seats and lost its dominance on seven local councils for a total of 1,137 seats. Even in the traditionally Labour strongholds of West Midlands and Northeast England, the Conservative Party gained control of both newly created regional mayors. IHS Markit's Purchasing Managers' Index revealed that British factory conditions increased from March's 54.2 level to April's impressive 57.3 reading. The consensus forecast had been for a drop to 54. Level 50 marks the divide between expansion and contraction. Both exports' and new orders' categories grew stronger in April than in March, giving legs to the view that the British economy is presently caught in what Deputy Governor Ben Broadbent of the Bank of England called the “sweet spot” of a devalued pound boosting exports while the nation still enjoys unrestricted free trade with the EU common market. The critics of Brexit continue to warn against economic misery and financial pain for leaving the European Union free trade block, but so far none of their gloom and doomsday scenarios have materialized for the world's fifth largest economy. Meanwhile, even as the British economy outperformed and showed surprising resilience and strength in the face of the Brexit from the EU single market process, the International Monetary Fund revealed that India is set to overtake both Great Britain and Germany to become first world's fifth largest economy by end of 2017 and world's fourth largest economy by 2022. This will leave Germany as number five and the U.K. as number six, with France dropping to number seven. Despite this inevitable change in the world economic order that has existed relatively unchanged since the end of the Second World War, India's will have to overcome several difficult challenges in order to achieve this impressive world dominance. Among these issues are dealing with the largest collection of distressed and toxic assets of all the major global economies, pushing through a comprehensive and much-needed tax system overhaul, boosting weak productivity, building up corporate investment, significantly growing employment prospects, and getting past the country's major shortfalls in available infrastructure. The world is changing all the time. Gold is the one safe haven asset that you can count on not to change. 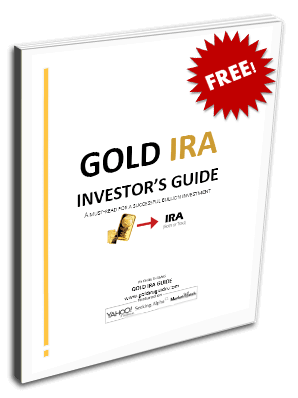 This is why in today's volatile and unstable geopolitical world, gold makes sense in an IRA now more than ever. It's time to consider a Gold IRA rollover.